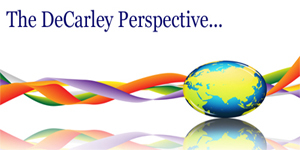 This commodity trading newsletter was emailed to the brokerage clients of DeCarley Trading on February 21. 2010. An early February plunge in stocks due to news of tightening actions by China and concerns over the solvency of certain members of the Euro zone came to an abrupt end on February 5th. The recent buying spree can be attributed to better than expected earnings (68% of companies reported better than expected 4th quarter profits and 71% topped revenue targets) and "less than horrible" economic data but we feel as though the majority of the gains have been posted on short-covering. As was the case throughout 2009, bear market moves have failed to achieve follow-through selling after luring the bears into the market. With so much pain being felt by short traders since the March lows, nearly a year ago, their wherewithal to maintain bearish positions has become quite short. As we have mentioned in the past, February is the weakest link of the "best six months" and thus far this theory isn't necessarily holding water. With just a week left to go in the month, the major indices are trading in slightly positive territory. However, some caution should be warranted. The bellwether S&P 500 is approaching what we believe to be substantial technical barriers. In addition, according to the Stock Trader's Almanac the end of February has been "miserable in recent years". For now, we feel as though the light volume rally going into option expiration is a bit suspect. Therefore, we are inclined to be bearish on rallies. 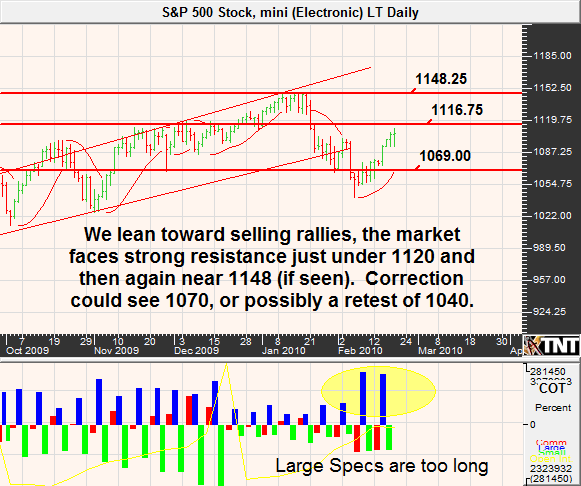 Resistance in the S&P comes in from 1115 to 1120 and we expect a correction to ensue from such levels. On the way down, the March futures will run into support near 1085ish but could see prices as low as 1053 if economic news disappoints. That said, a weekly chart is pointing toward 1150 so the bears should be prepared to take profits on any short-term pullback. 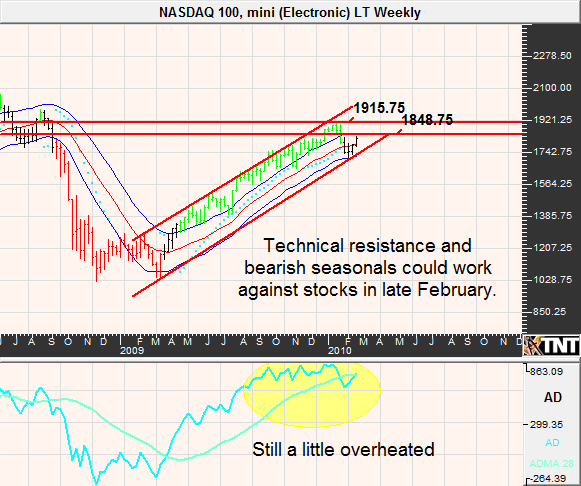 Mid-March is known for strong equities and this might be the market's opportunity to retest the January highs. Despite strong inflows of foreign capital in the month of December, recent Treasury auctions suggest that overseas investors are beginning to lose some interest in government backed fixed income securities. With the mounting U.S. debt and a volatile currency, I doubt that anybody can blame them. On the other hand, the looming "top" in Treasuries will likely come when it is least expected and for now the market seems to be convinced that the bear is back. Jobs data continues to show struggles in the employment market and recent inflation data appears to suggest that imminent price pressures have yet to materialize. Also, Treasury bulls tend to have the upper hand until mid-March. Conversely, the Fed took a baby step in eliminating some of the excessive policy moves to curb the recession and have telegraphed that the days of cheap credit are winding down. 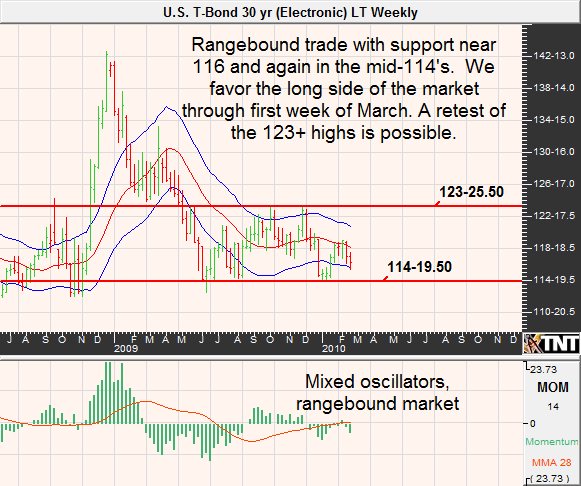 In last month's newsletter, we mentioned that we were looking for the March bond to hold resistance near 118'15ish, and we now know that prices saw the mid-119's before turning around. 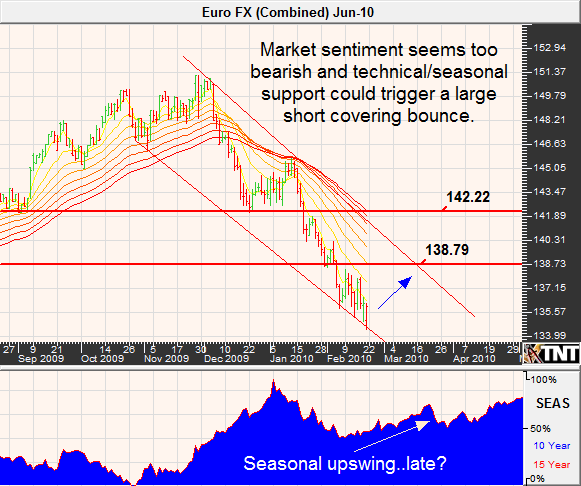 However, with the market at the opposite end of its trading range we are looking for an upswing. We feel like a retest of the 118+ area (basis June) is in the cards but if equities struggle, as we think that they might, we will be looking for the June bond to see the 121/122 area once again before succumbing to a large bearish move. If we are wrong, look for support near 113'15 and again in the mid-112's. If you are trading the note, a retest of the highs will equate to 117'16 in the June contract with a possible rally to 119 if stocks spill. Support lies at 114 and then again near 113'04. Last month we accurately predicted a strong rally in the dollar and noted that such a move tends to put pressure on grain prices. However, we unwisely, and now we know inaccurately, chose to put more weight on the bullish factors in grains. Our hopes for an oversold rally in grains turned out to be nothing more than that, hope. In the meantime, the complex has continue to troll the lows with little in the way in volatility and this seems to have created a scenario in which the majority of small speculators are short. Accordingly, the chances of a short covering rally appear to have increased dramatically and our expectations of a weaker U.S. dollar in the near-term should support our hypothesis. 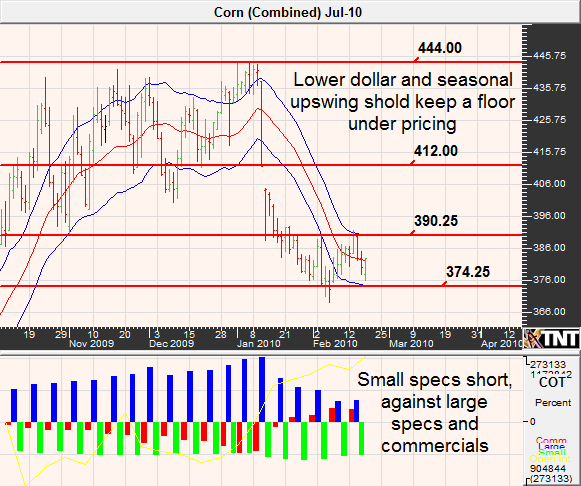 Corn prices were elevated throughout the fall as cold and wet harvest weather prompted supply concerns. However, a bearish USDA report on January 12th and news that China was beginning to put the brakes on its economy turned the market sharply lower and prices have yet to recover. On February 9th, the USDA reported that the 2009/2010 ending stocks estimate was reduced from 1.764 to 1.719 million bushels and this should be relatively supportive for pricing. Also, our expectations for a correction in the greenback should also act as a price floor. In both January and February, the USDA lowered their estimates for 2009/2010 ending stocks leaving expectations at about 210 million bushels. However, the numbers are still considerably higher than last year's figures. The newest estimates puts the stocks to use ratio at 6% and this is considered to be relatively tight based on historical standards. Conversely, world ending stocks will increase from 42 to 60 million tons, or 35% of annual use. In other words, although there is a minor shortage of domestic soybeans the global supply is somewhat abundant. Lackluster fundamentals could lead to a retest of the lows, but we prefer being bulls on dips. After all, a weaker dollar could pick up demand for the commodity and the "spring rally" should be just around the corner. 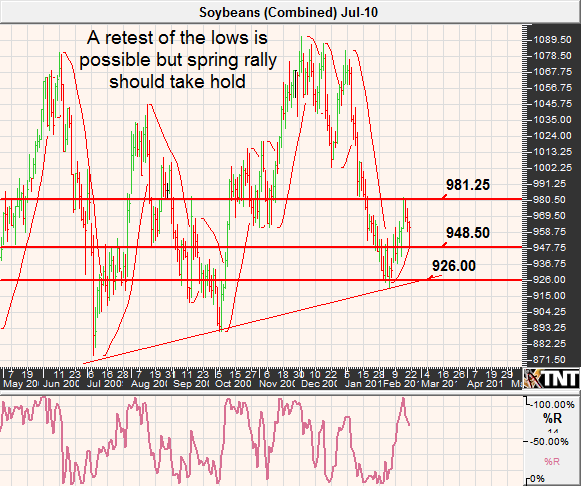 Look for minor support near $9.48 and then more reliable support near $9.26 in the July soybean futures. Once a low is found, $10.67ish isn't out of the question. This would bring prices closer to the top of the current trading range. According to both the DOE (Department of Energy) and OPEC (Organization of Petroleum Exporting Countries), world demand for crude will be approximately 85 million barrels per day. This is slightly higher than the 2009 demand figures but not necessarily enough of a change to justify the price swing from the high $30 range to $80. Nevertheless, markets have a tendency to overshoot equilibrium and the 2009 plunge was as great example of just that and crude prices will likely experience overvaluation on the way up. Although crude is becoming increasingly overheated and is facing strong technical resistance, it seems as though the looming correction in the U.S. dollar could be the catalyst needed to retest the January highs. According to our seasonal data, this theory could be supported by what is often a spike high in the first week of March before succumbing to a nearly month long correction. Last month we stated that we believe that the odds favored an eventual move to just under $70, and the market cooperated. This month, we still prefer being bearish but caution that despite there being technical resistance in the May contract just over $80, this rally could have some steam left. An intermediate-term upswing in gold was interrupted by concerns over the solvency of Greece on February 4th to leave the metal worth nearly $50 less than the previous session. However, as concerns over Greece debt have subsided, or at least fallen out of the headlines, gold futures have recovered to pre-realization levels. Still, benign inflation and supply and demand fundamentals seem to be working against the price of gold. On February 17th, the WGC (World Gold Council) announced that production of the metal was up 6% while total demand was down 11% in 2009. 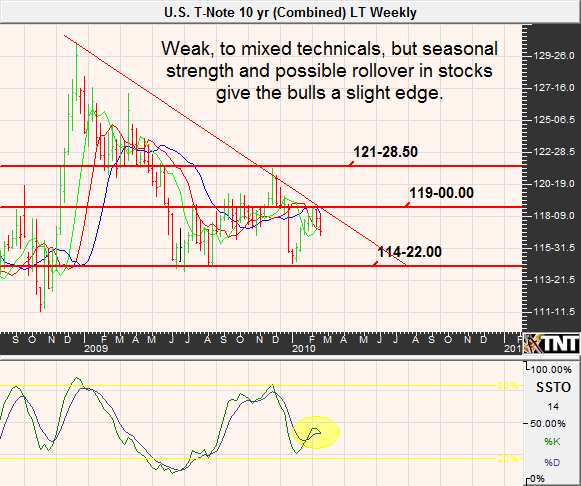 Also, the seasonal prospects for the metal suggest that the current rally might be short-lived. 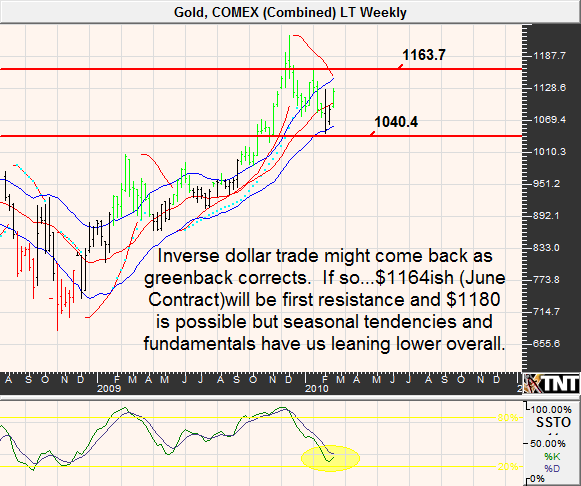 Although, if we are right about a swift pull-back in the greenback, gold will be a direct beneficiary. Looking at the June contract, it appears as though the rally could see $1164 before running into sharp resistance. Should the market be focused on the inverse relationship to the dollar, it might even be possible to see $1180. However, we are bearish from the noted elevated levels. 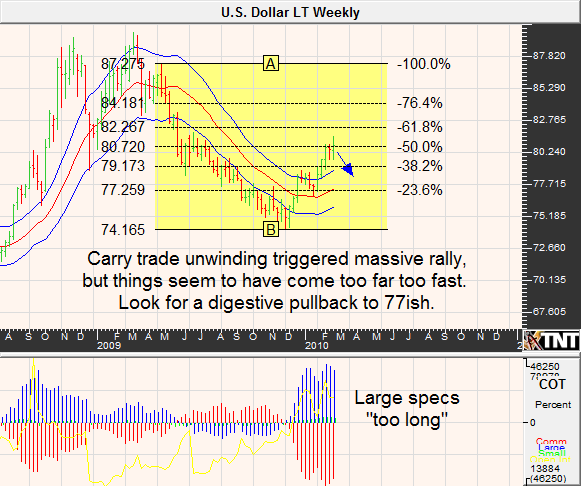 In late 2009 we warned of a possible unwinding of the carry trade that had left most speculators short the U.S. dollar and long any currency that was backed by higher interest rates. In early 2010, the market was reminded that there is no easy money to be made, even if interest rates are on your side. In the past few months, the short dollar carry trade seems to have worked itself out of the market and in the meantime has forced the dollar higher and it's counterparts drastically lower. We feel as though there are a lot of reasons to be bullish the dollar in the long-run, such as a Fed that might be a little quicker to pull the trigger on higher rates, a seemingly "less bad" economic backing and the sovereign debt troubles lurking in Euro-land. However, the short-term prospects don't seem as promising. The Dollar is technically overbought on nearly all time-frames and as measured by nearly any technical indicator and it will be difficult for the momentum to continue without some backing and filling. Last month we liked the idea of being a buyer of the March futures near 76.60 but this month we are taking the other side of the coin. 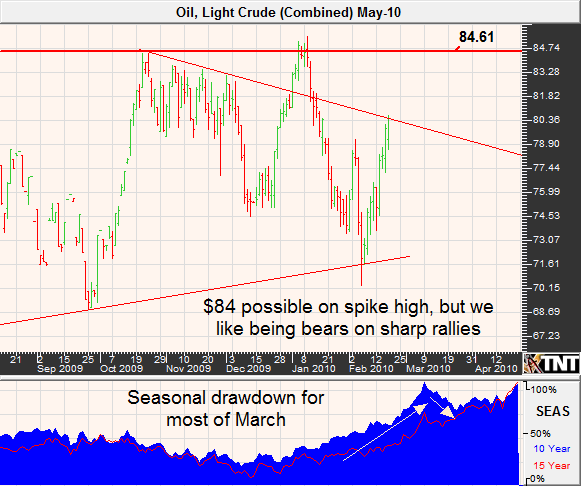 We (boldly) believe that 81.50 will act as the near-term top but if we are wrong the next resistance lies near 83.30. Either way, we feel that a pullback will bring the index closer to 77. Conversely, the Euro is suffering at the hands of excessive debt in countries like Greece, Portugal, and Spain. Additionally, The EU is predicting a roughly 1% combined growth rate for member countries in 2010 and on January 29th the unemployment rate increased from 9.5% to 9.6%. This was the highest since the same month of 2000 and manufacturing data is in the dumps. We had been looking for the Euro to find support near 1.3500 but a surprise announcement from the Fed on Thursday evening triggered selling that brought the March contract to a low of 1.3442. Nonetheless, we believe that the tides might be turning in the currency realm. It seems as though the market sentiment has become overly bearish the Euro and this often means that most of the bears are already in. We predict that a short covering bounce could trigger a rally to 1.3879ish in the near-term but ultimately just over 1.4200. Record high prices in sugar have never been able to sustain themselves in the long-term but the question is always how high can prices go before the plunge ensues? In 1980 prices peaked near 45 cents but was trading near 16 cents about 6 months later and within a year prices had declined to nearly 6 cents. Similarly, in 2006, sugar peaked near 20 cents but fell to under 10 cents within 8 months. Assuming that the current rally has seen its highs, it seems likely that the market will see 17 cents at some point in the near future. The relentless rally in sugar has come on the heels of tight supplies (challenged production in India and Brazil) along with strong demand for the sweet stuff. However, it is important to note that the majority of sugar stats are derived from sources other than the USDA and might not be as reliable. Also, the numbers that are published by the USDA are often revised as far back as 4 years; it is this lack of transparency that enables market prices to see such large peaks and valleys. Last month we were looking for a pullback that brought the March sugar contract closer to 25 cents, and we got it. This time around, we are looking for the opposite. It seems as though the 25 cent area offers significant support in the May contract and that a technical bounce to 28, or even a retest of the highs should the dollar correct and energy prices move higher. However, we prefer being bearish at higher prices. Declining U.S. and word ending stocks have supported a strong rally from the March 2009 lows but there are looming questions in regards to the demand for U.S. cotton and increased planting acreage devoted to the fiber. There is some talk of planted area jumping as much as 2 million acres for the coming year and with lower grain prices, the competition for acreage won't be as stiff. It is also important to note that speculators have entered the market in droves to cause a large increase in open interest in the last 6 to 8 months. The dramatic change in market participation could magnify any corrective action and this leaves the fate of recent gains vulnerable to liquidation. While the short squeeze might extend another penny or two, we wouldn't expect the May futures contract to be able to get much higher than 81.50/82 area. Accordingly, it might be an opportune time to begin building a bearish cotton position through either short options, we like anything in May 85 or above, or a more aggressive strategy such as a bear put spread with a naked leg. For instance, it might be possible to sell the May 85 call, buy the May 77 put and then sell the May 72 put for about $200 out of pocket (before commissions and fees). It took the lean hog market a considerable amount of time to rebound from its "swine flu lows" but higher export numbers tightening supplies seem to have done the trick. According to the USMEF (US Meat Export Federation) pork exports were up 8% in December from a year ago. Also, the USDA claims that frozen pork storage was down 15% from the prior year on December 31 and Canadian statistics suggest that hog inventory on farms is at the lowest level in 12 years. Tight supplies come as no surprise, many hog producers were forced to shut their doors last year as market prices were below the cost of production for quite some time. Last month we noted that "... when all of the bullish news is out and the market has already reacted, it makes it difficult for further gains. At this point, the bulls are already in and the bears are licking their chops. " In the meantime, hog prices suffered a dramatic correction but have managed to make their way back toward the highs and we happen to feel the same way about selling rallies. Our bearish outlook on live cattle (discussed next) along with neutral to weak seasonal tendencies leaves us looking lower overall. That said, be patient and don't go "all in" right away. 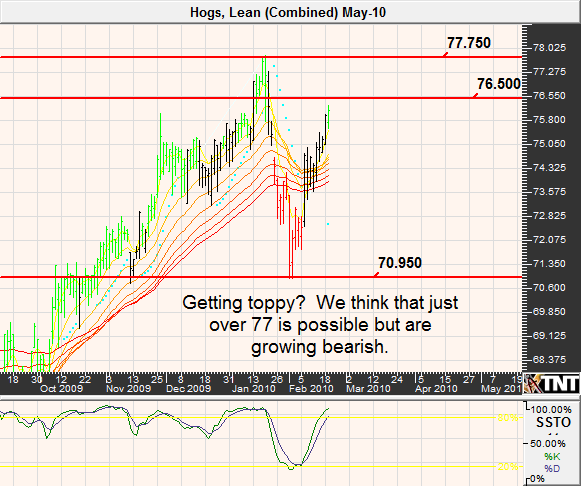 Prices could see the mid-to high 77's before turning over. If our assumptions are accurate, the first support will be seen near 74 on the way down but 71.50 isn't out of the question in the absence of surprisingly bullish fundamental news. A surprisingly weak cattle on feed report released by the USDA on February 19th showed that the number of cattle being prepped for slaughter is down nearly 3% from a year ago. If you aren't familiar with the government's account for cattle inventory, there are three steps to getting cattle to the grocer's meat department. The first is called "placement, which is the cattle that are removed from grazing (eating grass) and put on corn and soymeal in an attempt to enable the animal to gain weight. The second stage is known as "cattle on feed", which is the number of cattle that are currently eating corn to gain weight in preparation of slaughter. In the final step, the cattle are "marketed" or have been sent to slaughter. In January, the marketings of cattle during January totaled 1.77 million. This was 2% above 2009 figures but is the third lowest number of fed cattle marketings for the month since the numbers have been tracked. 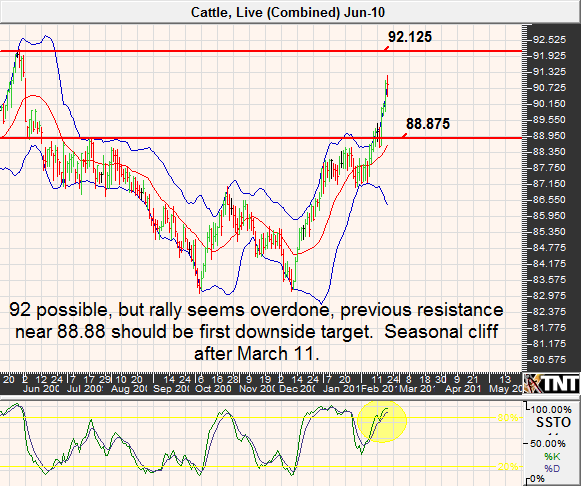 The tight supplies have triggered a massive rally in live cattle, but we can't help but feel as though a bulk of the bullish news is already behind us. In light of the looming bearish seasonal weight and overbought technical conditions it might be difficult for the rally to sustain itself in the long run. We see the possibility of a retest of summer 2009 highs but prefer being bears from current and moderately higher levels.